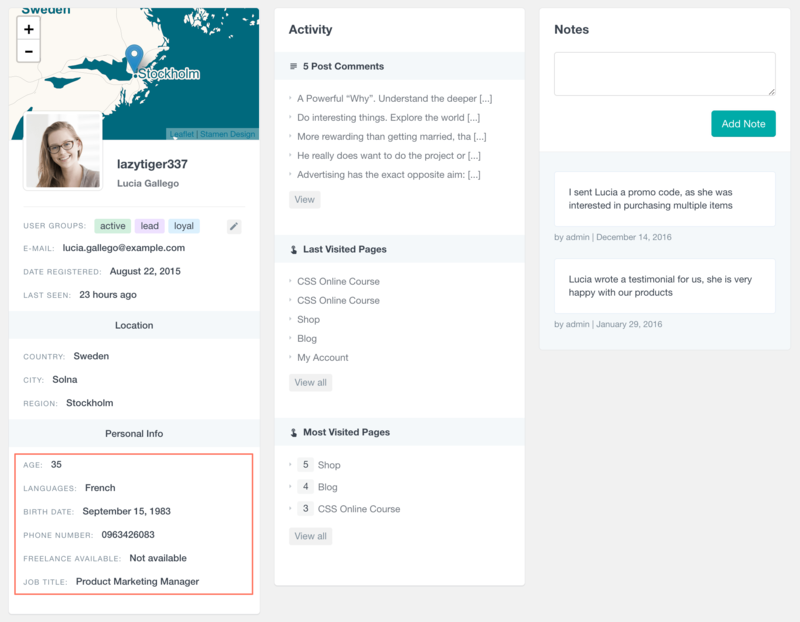 The Profile Builder Pro module of Users Insights can help you explore and search your WordPress user data. Users Insights automatically detects the fields registered with Profile Builder Pro and makes them available in the Users Insights table and filters. Once there, you can explore the data and search your users based on the form field values. Based on the registered field type and settings, Users Insights will automatically provide the corresponding filters and sorting options. For example, for select fields, you will be able to choose from the available options and for numeric fields, you can apply a numeric condition. The most common text-based field type is the Input field, which lets your users enter a text in an input field. Other text-based field types in Profile Builder Pro are the Phone, Textarea and Email types. With these field types, you can apply basic text search operators. These include “is/is not”, “contains/does not contain”, “starts with” and “ends with”. There are also the “is set/is not set” operators that you can use to find whether the field exists or not for your WordPress users. The following example illustrates using the “contains” operator in the filters, that allows us to search a field by a string that it contains. And here is another example of using the “starts with” operator for the Phone number field. This can be used, for example, to filter the users based on area code. When you register a Number field with Profile Builder Pro, Users Insights will automatically detect its type and provide the corresponding sorting functionality and filter operators. With Number fields, you can apply conditions such as “is/is not”, “is bigger than” and “is smaller than”. With the setup shown above, we have the “Age” field which is registered as a Number field. In the following screenshot, you can see this field loaded in the table. We have sorted the user table by the field in a descending order. We have also applied a filter to find the users whose age is smaller than 30. The Radio and Select fields in Profile Builder Pro allow your users to select one option from a predefined list of options. Besides the default Radio and Select fields that let you define the available options, there are a few other field types that Profile Builder Pro provides with a predefined options. Some of these are the country, timezone and currency select fields. With these field types, Users Insights automatically detects the predefined field options and makes them available in the filters. The available user search filters are “is” and “is not”, that you can use to find the users who have or have not submitted the selected option respectively. And of course, there are the “is set” and “is not set” filters that can help you find which users have submitted a value for this field. The following example illustrates filtering by the “Freelance available” select field. As you can see on the screenshot, the filter provides the list of options that are available for the users to choose from. Similarly you can also use the “is not” filter to find all the users who have not submitted a specific value. With the Checkbox and Multiple select field types in Profile Builder Pro, your users can select multiple options from a set of predefined options. Similarly to the Radio and Select fields, Users Insights detects these options and makes them available in the filters. The difference here are the available filter operators, since each user can select multiple values. There is the “includes” operator that lets you find which users have selected the specified option, and there is the opposite “does not include” operator. With the field setup that we have shown above, you can see that we have a “Languages” field that is a Multiple Select field. The example below illustrates filtering the WordPress user table by this field. This time we have applied two filters. The first filter gives us all the users who speak English. The second filter segments the user list further, to show us the ones who don’t speak Italian from those users. For this field type you can use date-based operators to search your WordPress users. These include “is on”, “is before” and “is after” (the before and after filters are exclusive of the date selected). To show an example, we can use the Birth Date field, which is set as a Datepicker field in Profile Builder Pro. We have applied two filters – “is after” and “is before” to set a range condition. Another section where you can explore the Profile Builder Pro data is the Users Insights user profile section. The profile section lists all of the detected Profile Builder Pro fields for the selected user. In this section you can quickly explore the single user data, as well as any detected user activity. You can also add user notes, edit groups or update any custom user fields that you might have. One of the main features of Users Insights is its advanced stackable filters. This feature allows you to combine any of the available filters, which means that you are not limited to the Profile Builder Pro filters. If you are using any of the other 3rd party supported plugins, you could use any of their filters along with the Profile Builder Pro ones. Or you can also use any of the Users Insights default features filters, such as Page Visit Tracking, Geolocation, User Groups and User Activity. In the following example, we have used the WooCommerce Ordered products filter, along with the Profile Builder Pro Age field filter and the Last Seen filter from the Users Insights Activity feature. You can use the Users Insights advanced export feature to export the Profile Builder Pro field data. Any form fields that Users Insights detects can be exported, just by making them visible on the user table. Additionally, you can apply any filters to export just a selected segment of your WordPress users. To export the Profile Builder Pro data, just click on the “Export” button and Users Insights will export the data in its current state – by applying the current filters and loading the selected visible columns. Please note that date fields are exported in a MySQL format, regardless of the format that is set in the Profile Builder Pro field settings. Another Users Insights feature that can help you analyze your Profile Builder Pro user data is the Reports feature. Users Insights creates automated reports for the numeric, select/radio and multi-select/checkboxes fields. The reports can help you visualize your user data and with this you can get some new insights to better understand your WordPress users. You can learn more about this feature on the Profile Builder Pro Reports page.